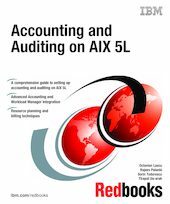 This IBM Redbooks publication is a comprehensive guide to setting up, maintaining, and troubleshooting the advanced auditing and accounting features on AIX 5L systems. It goes through the steps to develop, monitor, troubleshoot, and optimize best practices for auditing and accounting in your environment. We provide an overview of what auditing and accounting can do for you, how to set up an auditing system, procedures for creating the right accounting system for your environment, and a summary of available third-party accounting systems that can plug into the AIX suite. Learn to decide how much accounting and auditing you need to do on your system and how to size subsystems to handle your requirements, and find a list of rules to help prevent and fix common mistakes. We also present the new AIX 5L V5.3 feature Advanced Accounting, which is based on mainframe technology such as interval accounting and transaction accounting. Advanced Accounting supports LPAR (logical partitioning), WLM (Workload Management), and Micro-Partitioning. This book is useful for system administrators, system security officers, companies needing to bill clients for system resource use, and anyone else looking for a flexible system to monitor system resources.